In this step, you will use the XML Bind Wizard to create the outbound response binding iiiPRO06_response.jar on the server. In this binding, the list of Employee Skills will be represented with a list, but the list of Employees will be defined as a fragment, in order to avoid nested lists. The Employee fragment will be written multiple times in the RDMLX code. a. With the iii Training project open in Studio, right-click on the Server XML Employees Response solution group and select New Solution. b. The Server XML Employees Response group should be pre-selected. Select the XML Binding Wizard. Enter iiiPRO06_response in the File input field. Click OK.
2. The XML Binding Project panel appears. Click the Browse button. Select the iiiPRO06_response.xml file and the click the Open button, then OK on the New XML Binding Project dialog. 3. Click the Outbound checkbox. Select the newly-created Outbound tab. 4. The bindings for the response XML are more complex than the inbound. 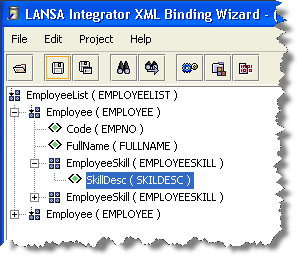 Code, FullName, and SkillDesc need to be mapped to specific LANSA fields. The Employee fragment will be written repeatedly in the RDMLX code. a. Right click on the EmployeeList root tag. Select Fragment from the pop-up menu. b. Right click on the Employee tag. Select Fragment from the pop-up menu. c. Right click on the Code tag and select Edit. Enter EMPNO for the Name and click OK.
d. Right click on the FullName tag and select Edit. Type FULLNAME for the Name and click OK.
e. Right click on either of the EmployeeSkill tags and select List. f. Expand the EmployeeSkill tags to see their sub-tags. Right click or double click on either of the SkillDesc tags to edit them. Enter SKILDESC for the Name and click OK.
5. Your XML Binding definitions are complete. Now, generate and compile the outbound response service. Select the Project menu and choose the Build option.